The finalists of the 2016 Marmite Prize for Painting have been announced, with 39 artists selected to take part in its fifth edition. Their work will feature in an exhibition hosted by Block 336 in Brixton and Highlanes Gallery, Drogheda, Ireland. The full list of Marmite Prize 2016 artists is: Richard Baker, Sarah Ball, Anthony Banks, Juan Bolivar, Philip Booth, Eleanor Breeze, Hannah Brown, Jo Bruton, Michael Calver, Diane Chappalley, Emma Cousin, Billy Crosby, Chris Daniels, Amanda Doran, Tamara Dubnyckyj, Steven Gee, Max Gomes, John Greenwood, Mandy Hudson, Clare Jarrett, Sooim Jeong, Michael Johnson, Albane Lamoril, Jessie Makinson, Lindsay Mapes, Kathryn Maple, José Batista Marques, Jo McGonigal, Sinéad Ní Mhaonaigh, Oliver Mulvihill, Helen O’Leary, Bernadette O’Toole, Selma Parlour, Alison Pilkington, Christiane Pooley, Sheila Rennick, Joan Sugrue, Suzy Willey and Daniel Woolhouse. The artists were chosen by a panel of five selectors: Marcus Cope (painter and co-founder & curator of the Marmite Prize for Painting); Aoife Ruane (director of Highlanes Gallery, Drogheda), Jane Hayes Greenwood (artist and director of Block 336), Daniel Sturgis (artist, curator and course director in painting, Camberwell College of Arts); Colin Martin (artist and school principal, Royal Hibernian Academy, Dublin). The prize will have one main winner, two runners up and a student prize. These will be chosen by a judging panel which has also been put together using an open call. Suggestions were sought for three painters based in the UK and Ireland to join last year’s winner Brian Cheeswright, with Phillip Allen, Vanessa Jackson and Mark O’Kelly chosen. 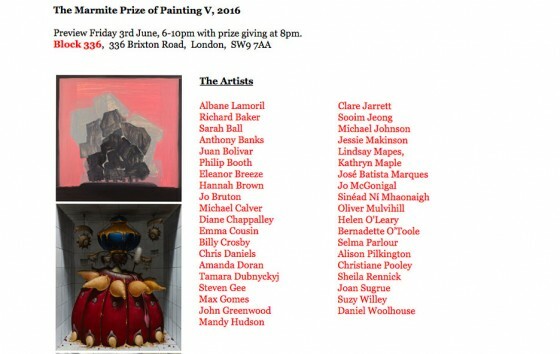 The Marmite Prize for Painting was set up in 2006, with subsequent prizes running in 2008, 2010/11 and 2012/13. The aim of the prize is to promote artist communities and networks, locally and nationally, connecting artists through the touring exhibition and related activities. Past winners of the prize include Iain Andrews, Dai Roberts and Michele Fletcher.